Clam Digger! 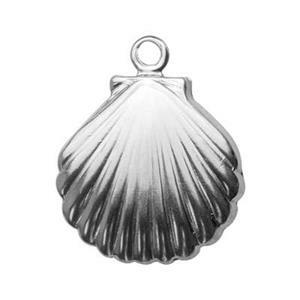 Whether you’re staying at the Inn – wearing the Crop Pants – or actually out on the beach Clam Digging … you’ll love our SL513 – Bright Sterling Silver Clam Shell Charm. These have a 1.1mm Inside Diameter Ring which will accommodate an 18 Gauge or thinner jump ring. For a Treasured Design, that you can wear year-round, complete your piece with one of our many Sterling Silver Footage Chains.